June 21, 2017. Hampshire. Today our new office is complete and CEO Chris cut the ribbon to open the building and welcome the team for the first time. 10 years ago Chris, Nick and Brooke founded JDi and we now begin a new chapter in an incredible new home. After acquiring the building a year ago and following 6 months of demolition, the rebuild and transformation began in earnest in January. 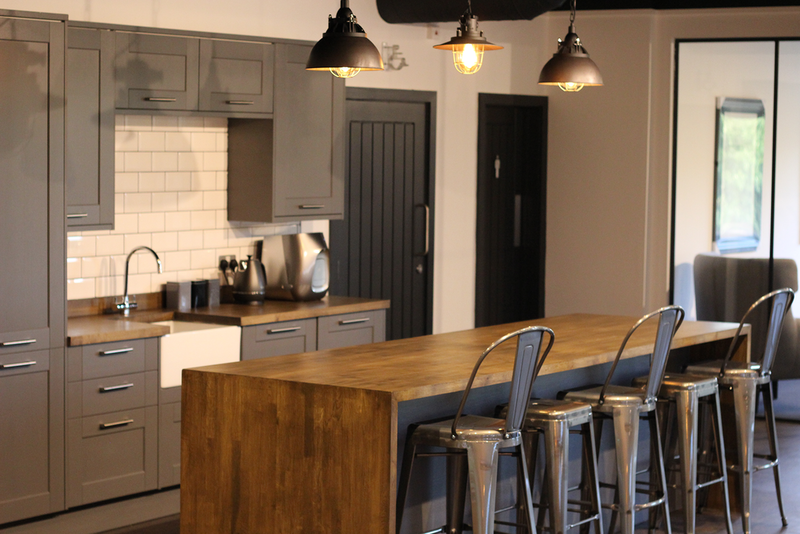 From the very start, the team were aiming for an industrial look with ample meeting space for both formal and casual meetings as well as the space and toys for the team to stick to our long held motto of work hard, play harder. A passing comment from Nick resulted in the addition of a half court Basketball court and in an effort to make us all look intelligent, The Book Exchange was built next to the pool table. Without the huge effort of Dan and Claire none of this would have been possible. Their design, vision and execution has delivered us an office that we can be truly proud of. Thanks guys, you nailed it. We'd like to extend a heart felt thank you to everyone that played a part in the build, development and completion of this project. Stuart from SWR Architects for taking our scribbled pencil drawings and turning them into a building. Gareth from Foresite Homes, for managing the project from the beginning and for handling our frequent and often late additions. Tony, Ryan, Tom & the team from Internal Environments for our incredible exposed services, air conditioning, lighting and electrical work. Andy, Woody, Lew & the team from Planet Partitioning for creating stunning glazed offices and an outstanding floor-to-ceiling office for Chris. Dancor Group for our curtain wall and for finally giving Chris the impressive office he deserves. David, Gavin and the team from CarpetZone for our beautiful floor, and for painstakingly installing a herringbone pattern. Just be thankful it isn't everywhere! Ben from Multiroom Media for our impressive TV wall in reception, allowing us to show off everything we do. Brian from Dorset Signs and Graphics for the finishing touches and ensuring everyone knows exactly who we are. And lastly our Site Manager Nick North, for being an absolute hero from start to finish. You are all welcome for a beer anytime.